BUCHAREST, Romania — Antigovernment protests in the Romanian capital turned violent Friday night as the police clashed with protesters, using tear gas and water cannons to disperse the crowds. 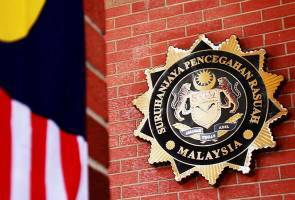 More than 240 people, including some security personnel, were reported injured. An estimated 100,000 people gathered throughout the day in Bucharest’s Piata Victoriei to express their anger at the government, with tens of thousands protesting in other cities across the country. Chief among their grievances are legislative changes that many say will weaken the rule of law. “We want democracy and laws that defend citizens, not politicians,” said Moise Maracine, 33, who flew from Britain, where he lives and owns a business. Organizers sought to draw Romanians living outside the country to this demonstration, the latest in a series. While the protests started peacefully, demonstrators’ efforts to push back the police barricades were met with strong resistance. Some among the crowd threw bottles and rocks at the police, and tensions grew as the night wore on. The protests came about 18 months after protesters staged the largest demonstration in Romania since the revolution that overthrew communism in 1989. In February 2017, a half-million people took to the streets to oppose an emergency decree that effectively decriminalized low-level corruption. Since then, the Social Democrat-led government has continued to push through legislation that critics believe will undo anticorruption steps taken after Romania joined the European Union in 2007. Last month, the chief prosecutor of the country’s anticorruption agency, Laura Codruta Kovesi, was fired after falling afoul of the government. Antigovernment demonstrations have become a regular occurrence in Romania, but in recent months numbers have dropped significantly as fatigue has set it. Friday’s protests were the largest in months. Previous demonstrations had passed with few incidents of violence. The use of tear gas by security forces stationed outside the main government building angered many in the crowd, and as the night wore on they refused to disperse. Shortly after 11 p.m., security forces began to forcibly clear the square of protesters. Klaus Iohannis, who holds the largely ceremonial post of president and has been an opposition leader in the past, denounced the violence in a statement on Facebook. Back in 2016, when Russian attorney Natalia Veselnitskaya met at Trump Tower with Donald Trump Jr., Jared Kushner, and Paul Manafort, the alleged topic of conversation was the Magnitsky Act. The first decade of Putin’s rule was a bonanza for state security structures. Using tactics similar to those used in the Browder-Magnitsky case, government officials, especially those in Putin’s native FSB, enriched themselves….They pillaged and nearly wiped out small and medium-sized businesses in Russia, jailing many of their owners in the process. Government programs and projects were dreamt up not to be built or actualized, but to allow their proponents to pocket parts of the state budget. ….Back then, a Russian businessman told me it felt like “the day before Pompeii,” with everyone stealing as much as they could as quickly as possible—and then whisking it out of the country….The families of the Russian elite often don’t live in Russia. They live in Paris, in London, Geneva, New York, Los Angeles. That’s where their money lives, too, and where their children go to school and where their families seek medical treatment—which is one of the reasons the Russian education and medical systems are falling apart, robbed by corruption of what little resources they had. ….What made Russian officialdom so mad about the Magnitsky Act is that it was the first time that there was some kind of roadblock to getting stolen money to safety. In Russia, after all, officers and bureaucrats could steal it again, the same way they had stolen it in the first place: a raid, an extortion racket, a crooked court case with forged documents—the possibilities are endless. Protecting the money meant getting it out of Russia. But what happens if you get it out of Russia and it’s frozen by Western authorities? What’s the point of stealing all that money if you can’t enjoy the Miami condo it bought you? What’s the point if you can’t use it to travel to the Côte d’Azur in luxury? Business associates of Mr. Browder have earned over $1.5 billion in Russia. They never paid any taxes, neither in Russia nor in the United States, and yet the money escaped the country. They were transferred to the United States. They sent huge amount of money, $400 million as a contribution to the campaign of Hillary Clinton. Well, that’s the personal case. It might have been legal, the contribution itself, but the way the money was earned was illegal. This is not the kind of personal shout out we usually get from Putin at these events. But he’s desperate. So with all this out of the way, let’s go back in time to the Trump Tower meeting and ask again: what was that all about? Well, it was about the Magnitsky Act, which the Russians urgently want repealed. But it was also about delivering dirt on Hillary Clinton. And this is the dirt: $400 million in sketchy campaign contributions from Bill Browder and his cronies. That didn’t work out—largely because it wasn’t true—but not for lack of trying. No matter where you turn, the Magnitsky Act is staring you in the face. If there’s any single thing that Vladimir Putin is pissed off about, this is it. So what did Putin and Trump talk about in their secret 2-hour meeting with no aides present? If I had to take a guess, I’d say it was the Magnitsky Act. Keep an eye on this over the next few months. Today, reader support makes up about two-thirds of our budget, allows us to dig deep on stories that matter, and lets us keep our reporting free for everyone. If you value what you get from Mother Jones, please join us with a tax-deductible donation so we can keep on doing the type of journalism that 2018 demands. Kevin is a political blogger for Mother Jones. Email Kevin [email protected] For more of his stories, click here or follow him on Facebook. Moscow, Russia (CNN) Prominent Russian opposition figure Alexey Navalny was detained during an anti-corruption protest in the heart of Moscow on Sunday, according to tweets by Navalny and his press secretary. Navalny downplayed his detention in a series of tweets and encouraged protesters to keep marching. “Today we are discussing (and condemning) corruption, not the detentions. Well, I was detained. So what. It OK. There are things in life that are worth being detained for,” Navalny tweeted. Similar demonstrations were planned in 100 cities across Russia on Sunday, according to organizers. 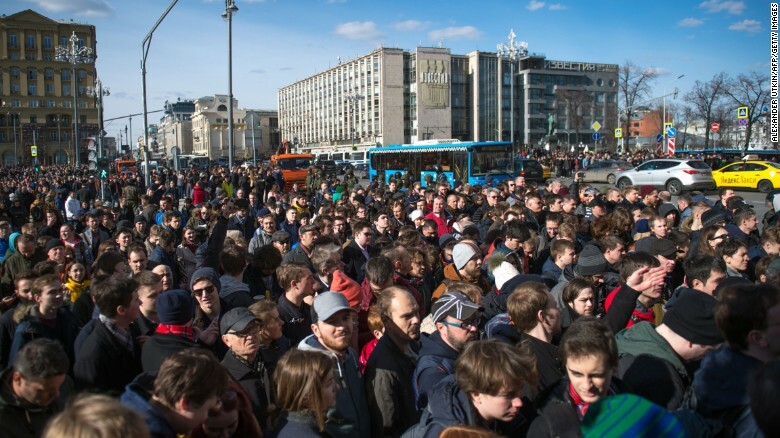 Tass, a state-run news outlet, reported that 8,000 people attended the protest in Moscow. Hundreds of arrests were reported at the Moscow protest. Russian human rights group OVD-Info tweeted that more than 700 had been detained — while state-run news agency Ria Novosti said 500 had been held. 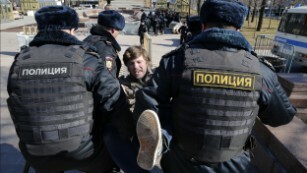 Police detain a protester in central Moscow on Sunday. The protest drew a heavy police presence but remained largely peaceful. Riot officers flanked crowds while plainclothes officers moved among the demonstrators. Police told those on the street that the protest was unsanctioned and asked them to move on. Navalny praised turnouts for the protests in early morning tweets. “Far East started fine,” he tweeted, referring to a photo of protesters gathering in the city of Vladivostok, located on Russia’s far eastern coast. Navalny also shared photos and tweets from various parts of the country. The protests are part of a campaign called “He is not your Dimon,” which uses the diminutive form of the Russian name Dmitry to refer to Prime Minister Dmitry Medvedev. Navalny has accused Medvedev of amassing a global property empire through various forms of corruption. Medvedev’s spokeswoman, Natalya Timakova, told state-run news agency RIA Novosti, “It is pointless to comment on the propagandistic outbursts of a convicted opposition figure, who has already announced he is running some kind of election campaign and fighting against the authorities.” Kremlin spokesman Dmitry Peskov called the report “not the first creative effort from this well-known convicted citizen,” according to Tass. Opposition supporters take part in an unauthorised anti-corruption rally in central Moscow on Sunday. Navalny, who rose to prominence during the large-scale anti-government protests in Russia in 2011, has announced he plans to run for the Russian presidency in 2018. In February, he was found guilty of embezzlement in a retrial of a case that dates back to 2013. Russian law prevents convicted criminals running for public office, but Navalny has appealed the verdict. Sunday’s demonstrations come at a time when the safety of critics of Vladimir Putin is under scrutiny. On Thursday, former Russian lawmaker and vocal critic of the Russian government Denis Voronenkov was shot dead outside a luxury hotel in the Ukrainian capital Kiev. Navalny has not commented on the killing. CNN has contacted him for comment. CNN’s Clare Sebastian, Radina Gigova in Moscow, Milena Veselinovic in London and Elise Labott in Washington contributed to this report. Prime Minister Narendra Modi dismissed on Tuesday the charge that big businesses were benefitting from the demonetisation drive, and said the poor are happy but some people are upset because his move has hit the “ringleader of thieves”.A single stroke has destroyed terrorism, drug mafia, human trafficking and counterfeiting, he said at a BJP rally in Uttarakhand.“Did you give me a full mandate in 2014 only to cut ribbons and light ceremonial lamps at inauguration ceremonies? Didn’t you elect me to combat and end corruption? Shouldn’t we fight the evil with all our might?” he asked. He targeted the Congress for opposing his government’s decision to demonetise 500- and 1,000-rupee notes, a move that he called a campaign to rid the country of black money and corruption. “Corruption has destroyed the country, which was known as a bird of gold. In some, corruption is in the blood. They used the backdoor to convert their money and thought Modi cannot see,” he said. He alleged that the Harish Rawat-led Congress government has taken Uttarakhand to “a bottomless pit of corruption” and the BJP alone could bring it out if voted to power. Drawing a metaphor for misappropriation of relief funds in the hill state, which was hit by a catastrophic cloud burst in 2013, he said even a scooter with tank for five litres could drink 35 litres. He urged people to vote the BJP to power so that “two engines” — the Centre and state governments — can work in tandem for the state’s development. Modi also referred to the OROP (One-Rank-One-Pension) scheme for ex-servicemen and saluted the defence personnel for understanding the financial constraints of the Union government and for agreeing to take the arrears in four instalments. The Congress and BJP have been at loggerheads in Uttarakhand ever since the Centre brought the state under President’s rule on March 27 after nine MLAs of the ruling party revolted against the Rawat government and sided with the opposition. Rawat was reinstated after he won a Supreme Court-monitored trust vote on May 10. The PM targeted the Congress while offering the Rs 12,000-crore Chardham highway project ahead of the assembly polls. Prime Minister Narendra Modi stood his ground on Sunday despite the Opposition’s growing clamour against his government’s move to recall 500- and 1,000-rupee notes, saying his decision will favour the country’s poor and middle class. The Modi government abolished the two high-value notes in an effort to stop corruption, circulation of illicit funds or black money and counterfeits, and to choke terrorist funding. “Uttar Pradesh ne bikau maal nahi bheja hai (UP has not sent a man who can be bought),” said Modi, who represents Varanasi in the Lok Sabha. “The corrupt people wanted such a government who will dance to their tunes, sleep on their bribes. Lekin aapne koi bikau maal nahi bheja (to Delhi),” he said at a BJP election rally in Agra. He praised the poor and middle class for supporting him and launched a veiled attack on West Bengal chief Mamata Banerjee and Bahujan Samaj Party (BSP) chief Mayawati — staunch opponents of the notes recall. “Some people have lost everything… Do you want to become an MLA? Bring this amount of cash. Then the cash was hoarded. But these notes belonged to the poor and middle class,” Modi said, referring to Mayawati’s alleged fund-raising style. Some of Mayawati’s former party leaders such as Swami Prasad Maurya have accused her of “auctioning” tickets for the 2017 polls in Uttar Pradesh. The BSP chief dismissed the charges. “It is the BSP’s firm belief that the BJP and the PM’s good days are over and bad days will come soon,” she said. West Bengal’s Banerjee, who led a march to President Pranab Mukherjee against the demonetisation exercise, came in for some sharpshooting from Modi. “I know who all are protesting against me. The whole country knows who were involved in chit fund. Many people invested but because of the blessings of politicians their money vanished. And they are asking questions to me,” he said. He referred to the Rs 2,500-crore Sharada chit fund scam in which several leaders of the state’s ruling Trinamool Congress got embroiled. The Prime Minister spoke extensively about the demonetisation drive at the Agra rally, although he has yet to speak in Parliament on the issue. Opposition parties are upset with his silence in Parliament. “This is a test by fire,” he announced as opposition parties got ready to stall Parliament’s winter session on the issue. People still returned empty-handed from banks and ATMs because of the cash crunch, but Modi sought to look at the brighter side. He admitted the hardship people were facing, which his government says will be a temporary phase, but reminded the people that the life of the corrupt will be ruined forever. “Dand diya hai (We have punished the corrupt),” he said. The lower house of Brazil’s National Congress has voted overwhelmingly to impeach President Dilma Rousseff for allegedly covering up the scale of the country’s budget deficit, sending the case to the upper house. As the vote was taken, anti-government demonstrations on São Paulo’s Avenida Paulista and outside the Congress held aloft a giant inflatable rubber duck, emblazoned with the message “I’m not going to pay the duck”—meaning paying for something when you shouldn’t have to. The duck, which has appeared at every pro-impeachment rally, has come to symbolize not only the movement against Rousseff’s ruling Workers’ Party but also wider discontent with government policies. In response, one particularly telling pro-government cartoon depicted the opposition as a “Trojan duck,” hiding years of uncertainty and a painful austerity agenda behind its innocent appearance. However, the color and noise at both pro-and anti-government protests masks a lack of consideration for the longer-term political implications of Rousseff’s impeachment, a process dominated by short-term, personal political leverage and political gain. After the government’s failed last-minute attempt to block the process in the Supreme Court, the Brazilian Congress’s Chamber of Deputies, the lower house, voted in favor of impeachment on April 17 after days of heated debates. The extent to which the vote will resolve the political crisis is highly questionable, while it also reveals the fundamental divisions and deep-seated problems of Brazil’s fragile democracy. The country has become further divided, as symbolized by the “wall of impeachment” erected in front of the Congress to separate pro and anti-government protesters. Hundreds of thousands of Brazilians took to the streets ahead of the vote, but this is not a straightforward story of a virtuous political class attempting to remove an unpopular president, given the public outcry. Although Rousseff’s approval rating increased from 10 percent to 13 percent in early April (and from 29 percent to 37 percent if we include neutral opinions), these much-cited figures hide a high level of public dissatisfaction with Brazilian politicians and politics. Almost a quarter of Brazilian demonstrators cited “politicians in general” as the object of their protests, whether they were in favor of the government or not. 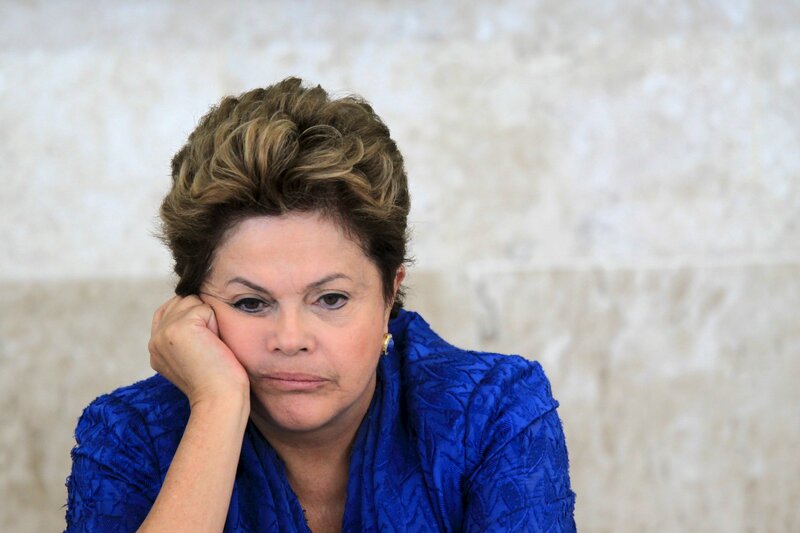 It has become clear that Brazilians are rejecting not only Rousseff but most other potential presidents too. And that makes for a deeply uncertain political future. Even before Vice President Michel Temer jumped the gun and leaked his presidential acceptance speech ahead of the impeachment vote, surveys found that only 16 percent of Brazilians wanted to see him govern the country—not much higher than Rousseff’s still-catastrophic ratings. Tellingly, almost two-thirds of Brazilians now believe that Temer should also be impeached, and 78 percent agree that the speaker of Congress, Eduardo Cunha, should leave office as a result of corruption allegations. That much was on display as the impeachment vote started: Anti-impeachment deputies unveiled a “Fora Cunha” (Out With Cunha) banner, and others explained their support for a “no” vote by pointing to Cunha, arguing that the impeachment vote was being presided over by another corrupt figure. All the while, the separate corruption investigations into the state oil company Petrobras have been rumbling along, and while they have yet to touch Rousseff herself, they have already engulfed a slew of senior figures. The impeachment debate has revealed just how many politicians are implicated in that particular scandal, and more besides: No fewer than 35 out of the 38 congressional deputies who voted in favor of starting the impeachment process in the first place are under investigation for corruption. Opinion polls show that Brazilians have not only become increasingly concerned about corruption but are also losing trust in democratic institutions. Confidence in the presidency has dropped from 69 percent in 2010 to 22 percent in 2015, but the least trusted are political parties, at 17 percent. Conversely, the Brazilian preference for democracy has been growing steadily, from 35 percent in 2003 to 54 percent in 2015, which is similar to the Latin American average. These figures suggest that the typical Brazilian supports democracy but is highly skeptical about the democratic credentials of the country’s politicians. This ambiguity is also apparent in public opinion about former President Luiz Inácio Lula da Silva, the likely front-runner in the next presidential elections. Lula is simultaneously the most hated and most popular political figure in Brazil today. In early April 2016, 40 percent of Brazilians thought he was the best president Brazil had ever had, with Fernando Henrique Cardoso (1995-2002) a distant second. However, another opinion poll showed that 55 percent of those surveyed said they would never vote for Lula but also rejected his main competitors with just as much disdain. That there is a strong base of support for Lula, who’s clearly positioning himself for another presidential run, might be surprising in light of the corruption scandals, particularly to those waving inflatable Lula dolls in a prison outfit at public demonstrations. But his popularity indicates that many Brazilians have benefited from his government’s social policies, which lifted millions out of poverty. That’s also borne out by a regional divide in his support: Disapproval rates are much lower in the north and northeast, where incomes are generally lower. But even if he could win an election, Lula’s chances of getting Brazilian politics under control are very slim indeed. While the decisive vote in the lower house to impeach Rousseff smacks of consensus and discipline, the country’s political culture is becoming ever more fractured and turbulent. Brazil is teetering on the precipice of constitutional chaos, and all the while the public is in full revolt against politicians’ ingrained corruption and venality. But even the protest movements themselves are fractured and contradictory, and no clear answers to their calls for political reform are forthcoming. Whatever the immediate future holds for all the lead characters, Brazilian politics will be messy and unpredictable for a long time yet. Marieke Riethof is a lecturer in Latin American politics at Britain’s University of Liverpool.